I’ve finally finished the first of my new buildings, a townhouse from TTCombat. It’s part of my nicer part of Port George and will help set the tone for the rest. 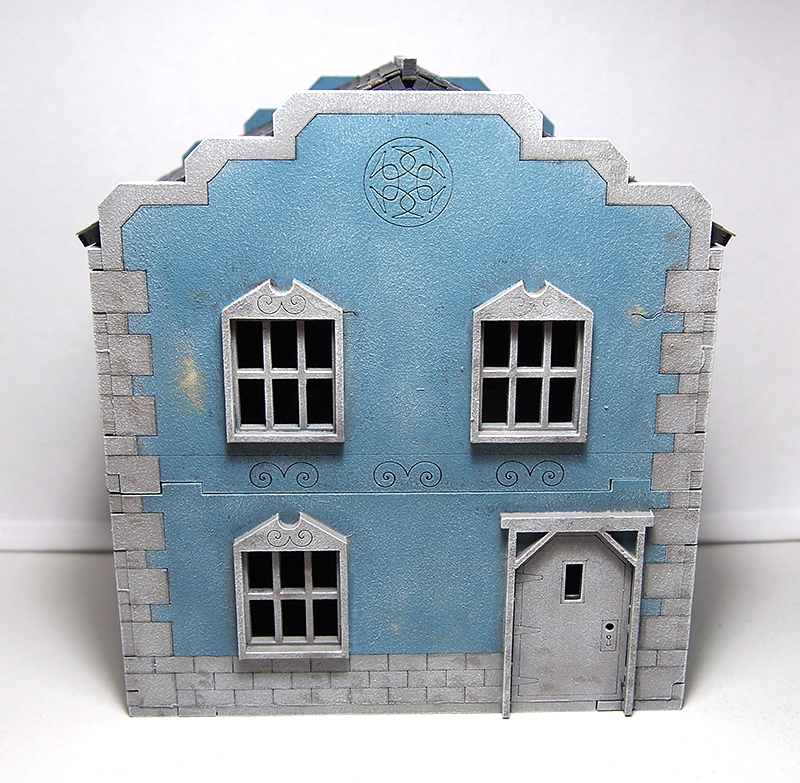 I’m thinking of doing the buildings in colourful pastel tones as it’s both historically fairly accurate and just looks nice. 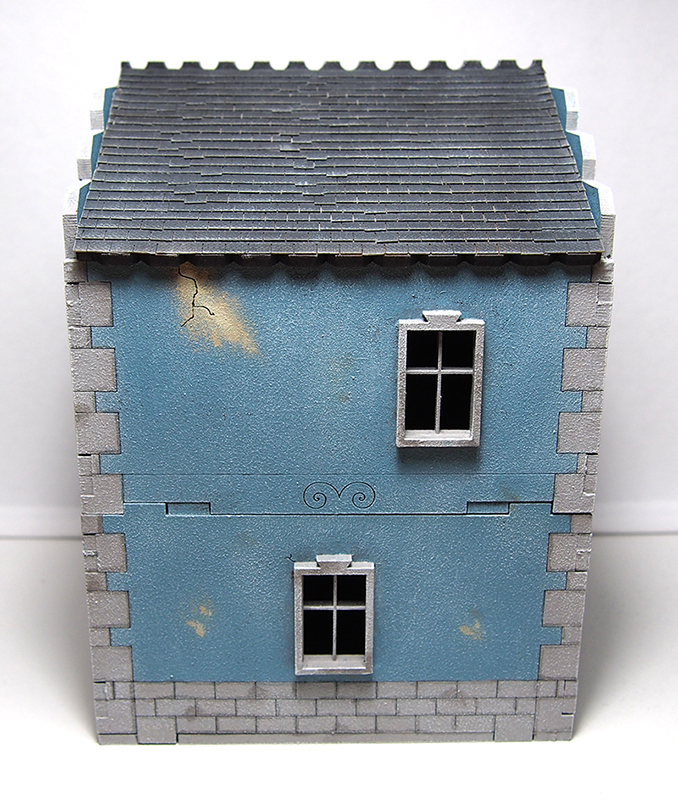 I have added a fair bit of grime though, to suggest an environment where the humid climate takes its toll on buildings. The painting process was very straightforward, and I used cheap craft store acrylics. 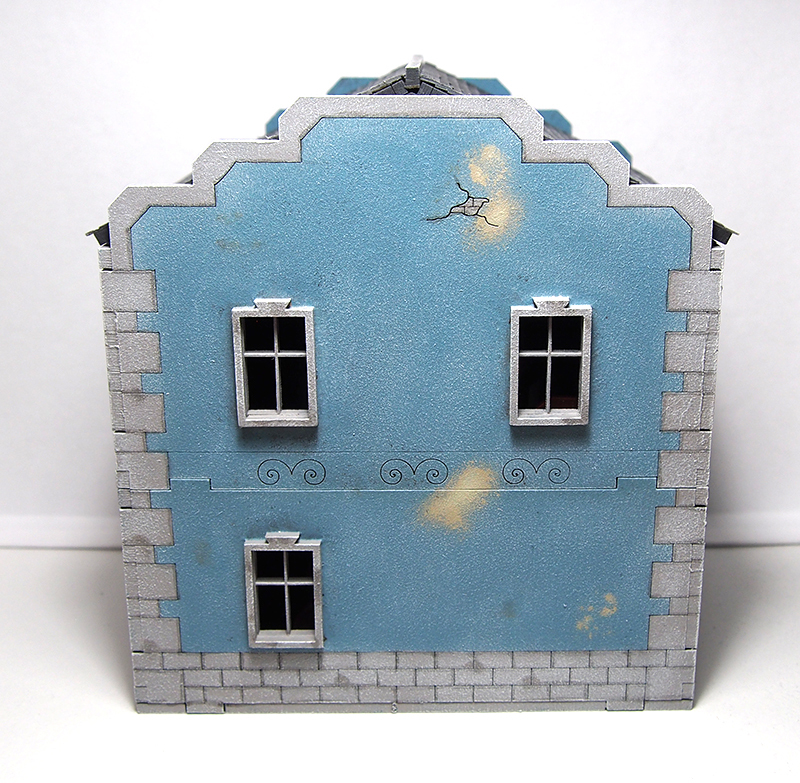 I stippled the paint on fairly thickly with a sponge, which gave the walls some extra texture. After that it was just drybrushing. I gave the roof tiling by using the now familiar roof tiling strips by Warbases. They are a lovely, lovely product, and I really like the result produced. 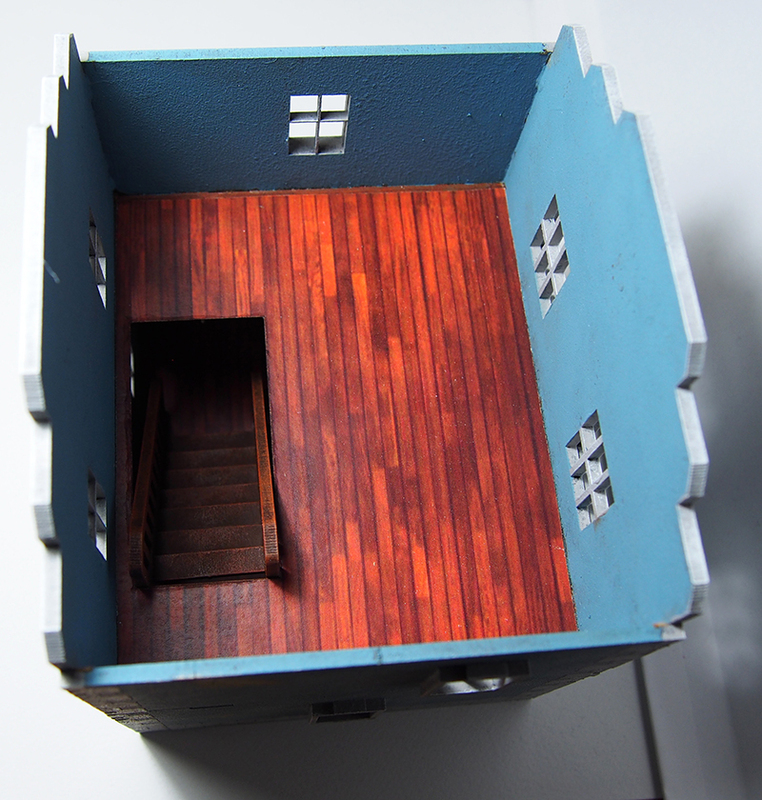 As the building features a fully playable interior, I gave it some attention as well. 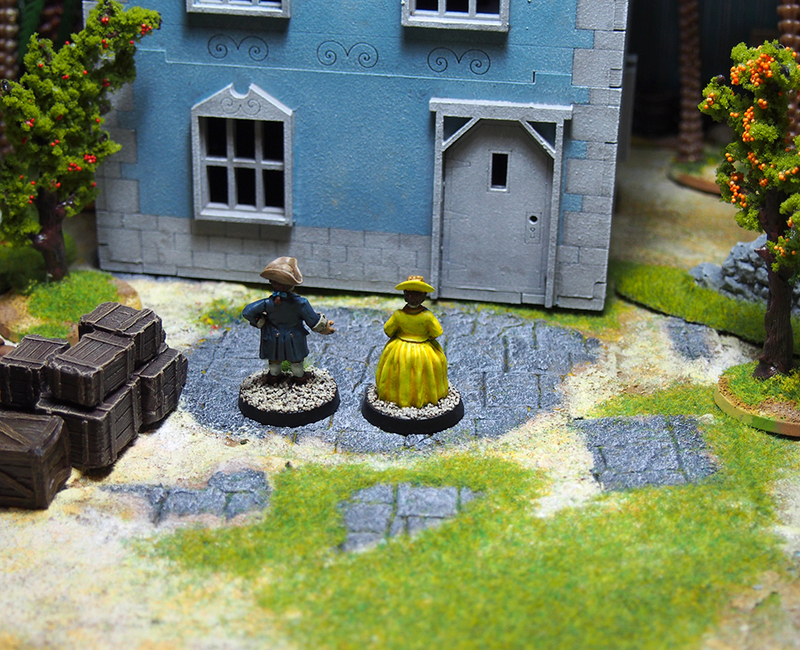 I spent a lot of time thinking about what I should do with the floors, and eventually settled on printing out some suitable textures on thick paper and gluing them in place. 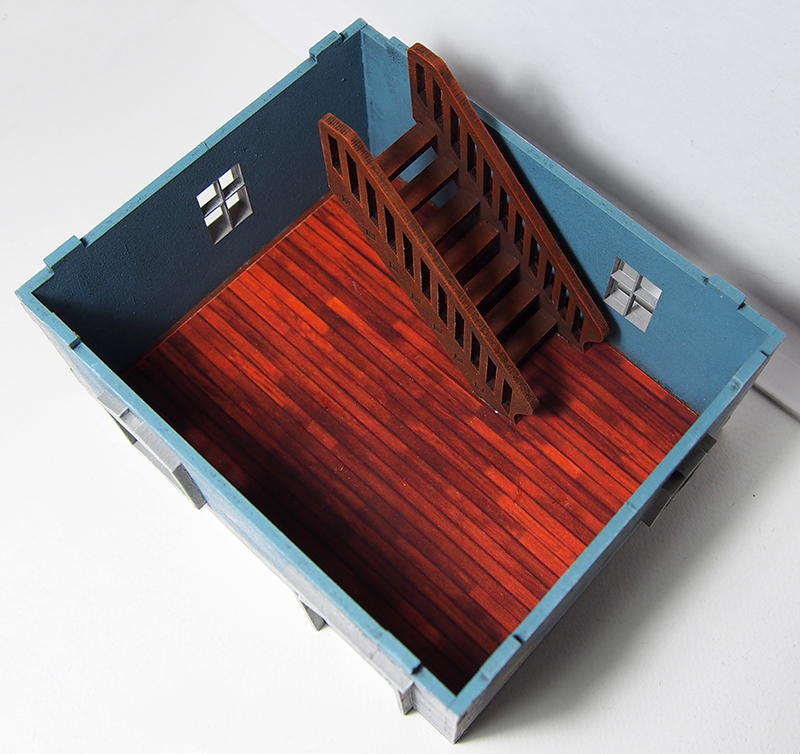 While I could have been more careful with the sizing (there are some small gaps), I’m really pleased with the end result and it save me a lot of time and money compared to building the floors myself from coffee stirrers or textured plastic. The inside walls I simply left the same shade of blue as the outside ones. There wasn’t really a need to work a lot on the interior, as I assume it won’t be used that frequently. Some furniture came with the house set, so that will probably get thrown in there at some point. Overall I was positively surprised by the finished building. Painting helps distract the eye and hide the jigsaw effect often prominent in laser-cut mdf buildings and the additional texture helps make the walls pop. The door is still massive, but it’s a very minor gripe. Looking forward to painting more of these! Next question on my mind: what kind of terrain board should I build for these? Excellent mate. I really enjoyed this post. I think the choice of colours was spot on. Thanks ork! I’ve done a whole lot of “colonial caribbean architecture” Google image searching, I can tell you. Glad that it has paid off! I find your level of research etc inspirational man. Very, very nice work, well done with these. Thanks for the kind words Carl! Very nice – I’d be happy to move in there myself dude, has it got a games room?